Here are some fun small projects that pop with color and textural interest. 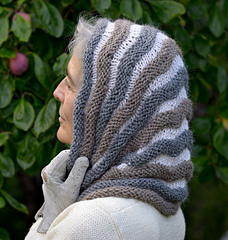 The pattern offers easy knitting and big drama with plenty of opportunities to play with color. 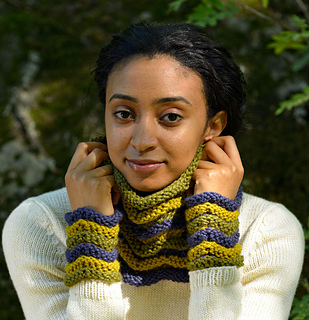 I’ve made three “sets”, one consisting of a skinny loop, wrist warmers and a headband, one with a bigger neck warmer and wrist warmers and the third just a long loop that can be pulled up and worn as a hood. The instructions have three different versions of the zigzag pattern so you can scale your chosen pieces up or down in size. 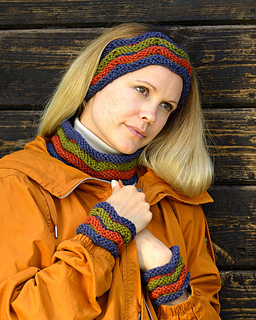 Sized for women, you’ll need one 100 g skein in each color for each “set”.